Looking towards the city at the 92-year-old trees slated for removal if Stage 2 of light rail is approved. Photos: Ian Bushnell. The ACT Government will only be able to replant trees on Commonwealth and Kings Avenues during construction of the tram line to Woden by taking out a traffic lane, according to urban planner John Easthope. 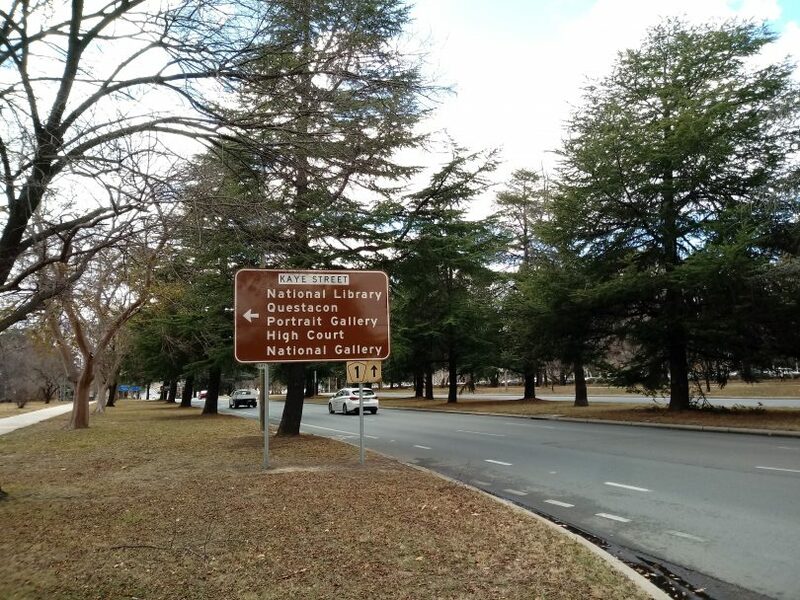 Mr Easthope, who worked for the National Capital Development Commission in the 1980s and for the past 20 years had been designing Canberra suburbs, has accused the Government of misleading the public over the planned removal of 28 historic trees on Commonwealth Avenue and about 20 others on Kings Avenue. He says the Government needs to come clean about why the 92-year-old trees have to go, rejecting the claim that they are in decline and saying they should be considered for their heritage value and retained. “I would like to point out that the trees are to be removed to allow the construction of the light rail in the median and its footprint requirements and not [because of] health issues. I would further outline that due to the impact of rail construction there will be insufficient room to plant trees legally,” Mr Easthope wrote in a recent letter to City News in support of horticulturalist Cedric Bryant. The Stage 2 Light Rail Update says the original Charles Weston 1920s cedar plantings have a life expectancy (assessed in 2013) ranging from five to 40 years, citing the National Capital Authority assessment that ‘many of the street trees are declining, and it’s timely to plan for tree renewal’. 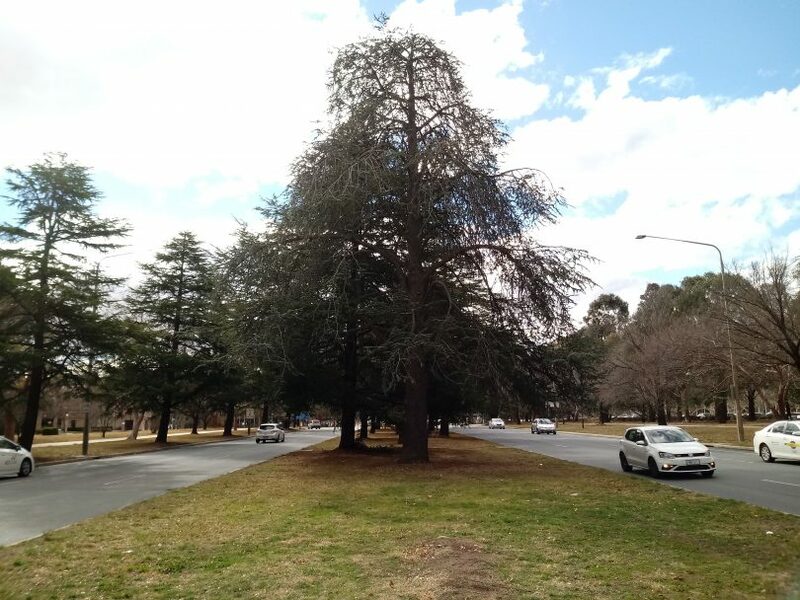 But Mr Easthope told The RiotACT that the 12-metre wide median was not wide enough to cater for the tram and trees, particularly low-branching cedars like the ones slated for removal. “I measured the tracks and clearances. Because the median is 12 metres wide, you need nine metres for the tram and one-and-a-half metres to plant a tree, let alone a cedar,” he said. “All those trees have to go because there is no room, and there is no room to replant trees, unless they take a lane and reduce the number of lanes on Commonwealth Avenue.” And a similar situation would be destined for Kings Avenue, as well. It was a similar situation in Kings Avenue. “Somebody should be held to task in terms of evaluating where the tram goes. Sure the trees may have to go but don’t blame it on the death of the trees, blame it on the fact that you need more room,” he said. He said the Government had been flippant and uncaring when it came to the fate of significantly historical trees in the Parliamentary Triangle, saying it was not clear what kind of trees would be planted or how it would be done. “The character of the area will change,” he said. Mr Easthope said there had also been a lack of thought into the consequences of running the tram through Barton. “They haven’t thought out the actual urban outcome, haven’t thought out how they’re going to plant trees, or what they’re going to do when it goes past Old Parliament House. Maybe they have but they’re not telling us, not giving us the full rationale about tree removal,” he said. He understood the Stage 2 preferred route came down to viability and cost-benefits, and that it was good for tourists in that area but ‘how do you do it sensibly?’. Mr Easthope said the tree plantings on the Northbourne median, which is twice as wide as the Commonwealth one, were designed to accommodate a tram down the middle, but they had all been removed to make way for light rail, with new plantings of contentious brittle gum replacing them. “As the name suggests, probably not a very sensible solution,” he said. And in the Adelaide news today they are going to fell 5,000 Queensland box trees because their seed pods are slip hazards for the elderly (don’t want them clogging up the hospitals with broken hips, do we). Thank goodness we have a dedicated Green running the ACT because without him the government would be chopping down even more and important trees. You make out like not a single tree was cut down to make the roads and to create the block your house is on. Or that only labor governments cut down trees. Though you could be right on the last point as only labor governments seem to build infrastructure. Amazed at the comments wanting to save these trees. They’re horrendous. Go for a walk in a reserve, drive out to the Brindabellas. These trees aren’t special. Cut em down! I’m thinking billboards!!. Ultimately theres no point debating light rail. vote labor get labor. Do you mean to say that only $8.00 of Wing Nut’s rate increase will go to fund the light rail? Depends.. are they only spending $3 million a year on light rail or not? I can see that you are moddlecodding the figures.. How about you work the other way to explain where the 10 billion dollars is coming from? At the end of the day everyone in the ACT will get paid a wage and those wages directly or indirectly pay for the whole light rail system. Be it though taxes or increased rates or levies, increased costs to get things done. How much is barr saving cutting buses? The buses would only account for 0.1% of the budget.. meaning 80cents of the rates pays for the bus? I was referring the “1%” remark by JC and yes, the term “1%” is very confusing and that’s why it is used. When I was in the rag trade one of my suppliers used to say “I buy stock for $1 and sell it to you for $2 which is only a 1% mark-up”. Fallen branches are dangerous to cyclists. They have to go. Part of the new 1.5 metre rule. Fallen branches are dangerous to pedestrians, motorists and cyclists alike. Its a good thing they outlawed trees of any kind in recent land developments. Another miss truth. But hey sounds good. I am saddened by my rates notice received today. The tram was not needed. If one lane each way has to go then use it for the tram and retain the trees. The government’s shocking lack of street tree replacements in and around Civic should warn us all about the future of the bush capital. Even New York City has better tree maintenance. Got our rates notice, up $800 for a townhouse in Palmerston. $800 towards Barr’s ego stroking projects. No vote for you Meegan. Think you will find the bulk of the $800 rise is paying for policies that they have taken to a couple of elections now rather than light rail which is less than 1% of government costs. I think you’ll find that if you take out GST income that percentage becomes a big part of discretionary funding. You just can’t not fund schools, hospitals, police and fire trucks..
Income is income. Weather it is rates, GST or charges it can be spent on anything. Only time is when it is a grant to spend on something in particular. Fact is light rail is less than 1% of the total budget. Compared to about 25% for health and 25% for education. This 1% statistic is meaningless without looking at the whole budget and where revenue and spending goes. As you’ve identified, health and education are massive expenditures and can’t easily be changed. The vast majority of spending is inflexible and can’t easily be cut. Revenue is similar, the GST and federal government grants make up a large proportion of income. Other taxes can’t easily be raised without negative economic effects. The entire transport budget for the whole of Canberra is less than 5% of the budget. So to put your “it’s only 1%” in perspective, that’s 1% of the budget for the first of multiple stages of a project, which only services a small proportion of the population. 1% of an inflexible budget that can’t easily be shifted to cut costs or raise additional revenue. Your own figures show what a huge impost light rail is and is going to be into the future. And what is the cost of NOT doing something? And what is the increased revenues from the urban regeneration of Northborne. So yeah it all makes a difference but to just bury ones head in the sand and do more of the same doesn’t help the future. Not saying and have never said light rail is the magic panacea but it is something that even at 1% of today’s budget and should I point out over time that 1% (but yes it is just for stage one) will drop as a percentage of income. Can’t see where anyone has ever suggested doing nothing, that’s a massive strawman but since you bring up opportunity costs, what are the costs of choosing light rail over the far cheaper alternatives that give the same transport benefits? What is the opportunity cost of some proper long term planning that could have delivered light rail when it was actually justified from a density perspective in 20-30 years time? The increased revenues from the regeneration of Northbourne could still have been achieved without light rail. But if the government was so keen on light rail as the only possible solution due to their political deals, why didn’t they actually capture some of the value uplift of land through a direct levy? Keep clinging to that “1%”, it’s clearly a massive impost that we’ll all be paying for years. If light rail increases to a full network the cost is 10% of budget. Thats huge. Spending 2 fifths of the health budget just getting people from a to b.
Constructing light rail from civic to woden is about the same cost of running buses there for about 100 years for the same route. You are not correct in this claim JC. ACT Government gets dedicated grants from the Federal government for Health and Education. Also Commonwealth grants for housing and other social programs that are based on population. bj it is 100% correct it is right to say it is 1%. As I said where the money comes from and goes is irrelevant at the end of the day even if some does have a fixed use which I freely admidsd. Likewise some of light rails cost is being paid by such incomes, assert recycling scheme for example. But that is convientabtly forgotten in the anti hysteria. Asset recycling could have been elsewhere but was tiny in comparision to the 10 billion ovarall cost. There have been two elections since the decision was made to introduce the trolley folly. Grevellia Robusta.https://www.nationalarboretum.act.gov.au/living-collection/trees/tree-descriptions/forests-and-trees/forest-51 is beyond me. It ticks all the boxes and has the most beautiful flower which could be the redeeming highlight of the concrete canyon Northbourne Avenue is about to become. Actually kind of agree that some more variety could be in order. As for the concrete canyon I reckon that it is already starting to soften up with the trees they have already planted and Flemington road in particular where they have mulched and planted “grasses” is looking pretty decent too. Far better a vista on Flemmington before where all you could see were streetlights. Now yes the overhead is there but it is no where near as noticeable as those lights and the lights are no longer as noticeable too. All because of some trees and landscaping. Now if only some of our other roads and yes looking at the Madura parkway could be better landscapes. The median landscaping on NSW roads like the Federal Highway and Hume make it far easy to drive on those roads compared to Majura Parkway. They have had it in for the trees around that area for years. What they stand in the way of is development. Our city is getting uglier by the day. Gums down Northbourne? Why in this day and age would you plant such dangerous messy trees in an area flagged to become more populous? Should have planted a more suitable tree (I know some have been suggested) or nothing at all. And the heritage trees on Commonwealth Ave should NOT be touched. Find a way around them if you must. But before that, ensure the tram is a roaring success. I have my doubts. Eucalyptus are hardwood, but I'm guessing you meant exotic deciduous type hardwood trees. Just as with Northbourne Avenue, trees which, in truth, are far healthier, structurally sound and eye-pleasing than many of the suburban trees which this government refuses to remove/replace will be eliminated. The conveniently glib words about trees “in decline” would be so much easier to swallow if this sole, simple, all-embracing criterion was applied across the board to decisions about all trees in urban Canberra. The trees that are not as old as people make out too. Just depends your overall view on Northborne. Bet if the plan was to remove them to create a 8 or 10 lane road many would utter a peep and say hey we still have plenty of trees down the outside. Like they claimed that *all* the original remaining gums on Northbourne Avenue had been damaged by that bad storm; funny how they survived all other storms over decades. This is just a scandal. I’d also be asking what’s the true cost of Stage One and when will it be completed. From what I hear, it’s nothing like the Government’s line. ACT ICAC’s going to be very busy. But does it matter Wing Nut? It will only matter if the Government forks the bill for the additional cost for stage 1, above what is agreed in the PPP contract. The whole point of a PPP approach, in part, is to put a greater proportion of the risk associated with capital development onto the private provider. There are no doubt contract terms that allow for some additional costs incurred to be passed on by the contractor, but for many common cost overruns, it would be the contractor that would ultimately wear them, not the Government. Because they are in the way. End of. Keep the trees and get rid of the politicians . The nature strips that exist practically everywhere in this city are part of what makes Canberra unique and quite beautiful. Getting rid of such areas would be an incredibly bad idea. It's not so much about the trees, it's the way politicians from all sides think they can feed the public some BS and just get away with it. Every time I drive on Northbourne, I am saddened by the loss of the gums. You do know they are replanting more trees than the sick ones they removed right? They have been growing them for years already at Yarralumla nursery. The trees along Northbourne get replaced about every 30 years so they would have been removed and replaced even if the light rail hadn’t happened. Stuart Hume Thank you for sharing that.